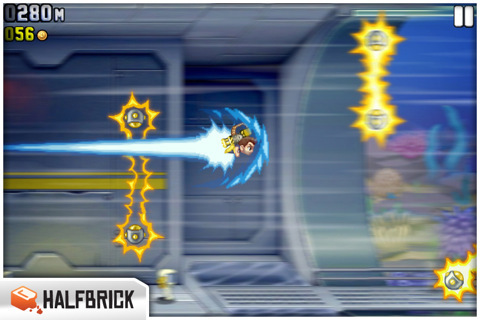 We’ve had our hands on an early build of Halfbrick’s Jetpack Joyride [99¢] for quite some time now, and ever since then I’ve been trying to figure out the best way to approach a review of the game. Between our own hands-on preview and Halfbrick’s series of developer diaries (Parts 1, 2, and 3) I’m really not sure what else can be said about the actual gameplay. Between myself, and Halfbrick’s own videos, you’ve seen everything that Jetpack Joyride has to offer. As explained in the previously mentioned preview, Halfbrick hasn’t done anything particularly innovative with the game, instead, they’ve taken a tried and true gameplay package and in essence, turned it up to 11. Halfbrick has taken the cave flyer formula which has been done to death and via their seemingly trademarked Australian majicks created a game that I simply cannot put down. In fact, just writing this article is proving to be difficult because every time I go back to the game to add something to my notes, I find 15 minutes has flown by as I’ve endlessly sent Mr. Steakfries to his doom via lasers, missiles, and zappers. What makes Jetpack Joyride truly noteworthy isn’t the array of power-ups, the endless customization, the various objectives, or the on death slot machine system. It’s really the sum of all these different parts that have created a game that has kept me playing to the point of disregarding real world responsibilities for one more go at Jetpack Joyride. And really, I believe this is the highest praise a games journalist could possibly give a game. In the world of the App Store, there’s a never-ending supply of new games to try. We maintain lists of games to check out, and it seems like those lists rarely, if ever, reach a point where we’re “finished" for the day. It’s a brutal cycle that doesn’t often afford us the ability to actually sit back and play the games we enjoy, because there are always other games to play from an endless queue of seemingly worthy titles that all deserve a once-over. This is especially true for me as I keep our team of writers on track and make sure all of our coverage jives. Jetpack Joyride is the first game in a very long time that has left me lagging behind checking my email, leaving the Adium icon hopelessly bouncing in my dock with new instant messages, and entirely disregarding the fact that my clothes have been sitting in the dryer for nearly four days now. Attending to emails, answering IM’s, and even folding clothes just loses out every single time to playing one more round and seeing how far I can go. Normally this is the part where I’d try to qualify what kind of person would most enjoy Jetpack Joyride with tired cliches like “fans of the genre" and other phrases we love using. But really, everyone I’ve handed my phone to in the past week to try the game has reluctantly handed it back with a massive smile on their face a few minutes later. Jetpack Joyride doesn’t need any kind of “if you like randomized endless games" or any other disclaimers. It is a game you simply must own. 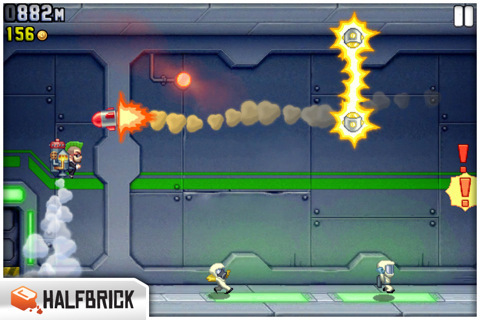 Jetpack Joyride is universal, and will run on every iOS device except for the O.G. iPhone and first generation iPod touch. There’s an entirely optional in-app purchase mechanic as well where you can buy coins instead of earning them in game, but since that basically robs you of any kind of progression and replay value I’m not sure why you’d ever do that– But, fair warning to those of you out there who get worked up over the inclusion of IAP, no matter how unnecessary it is. If you for some reason need some additional convincing before mashing that download button in iTunes, swing by our forums where you’ll see similar praise for this incredible game. * NYAN IS BACK! IOS EXCLUSIVE LEVEL AVAILABLE NOW!